March 20, 2013 – Wednesday at King’s College, London, Strand Campus. Seminar 4.30-5.30 in room K.311 and the book launch 5.30-7.00 in the the Small Somerset Room. In 2009 Parikka and Sampson coedited The Spam Book, a collection of articles intended to probe the “dark side” of digital culture. The Spam Book addressed a shift from a digital culture very much defined in terms of the economic potential of digital objects and tools toward a discourse describing a space seemingly contaminated by digital waste products, dirt, unwanted, and illicit objects. In this seminar and the following book launch, Parikka and Sampson discuss emerging ideas and theoretical approaches to digital culture. Parikka’s media archaeological approach and Sampson’s research on virality provide insights into worlds of affect, anomaly and the alternative genealogy from which our network culture emerges. Parikka’s recent book What is Media Archaeology? pitches media archaeology as a multidisciplinary 21st century humanities field that resonates with a range of recent scholarly debates from digital humanities to software studies and digital forensics. Media archaeological excavations and discussions on such theorists as Friedrich Kittler offer an alternative insight to the current digital culture/economy debates in the UK. Sampson’s approach to digital culture brings together a Deleuzian ontological worldview with the sociology of Gabriel Tarde. His subsequent theory of network contagion does not, as such, restrict itself to memes and microbial contagions derived from biological analogies or medical metaphors. It instead points toward a theory of assemblages of imitation, viral events, and affective contagions. For Sampson, contagion is not necessarily a positive or negative force of encounter; it is how society comes together and relates. Sampson provides an assemblage theory of digital culture concerned with relationality and encounter, helping us to understand digital contagion as a positively sociological event, building from the molecular outward, long before it becomes biological. 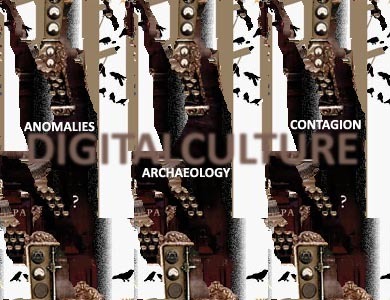 Parikka’s media archaeology and Sampson’s contagion theory both figure the importance of a materialist approach to the imaginary and the nonconscious as central to an understanding of digital culture. Hence, the seminar asks the question: what is the nonconscious of digital culture? The seminar is followed up by a book launch of Parikka’s What is Media Archaeology and Sampson’s Virality: Contagion Theory in the Age of Networks. Both books are available at the event along with wine. Jussi Parikka: What is Media Archaeology? Polity Press: Cambridge, 2012. Tony D. Sampson: Virality: Contagion Theory in the Age of Networks. University of Minnesota Press: Minneapolis, 2012. Jussi Parikka is Reader in Media & Design at Winchester School of Art, and author of Digital Contagions (2007) and Insect Media (2010) as well as (co-) editor several edited collections, including The Spam Book (2009), Media Archaeology (2011) and Medianatures (2011). He blogs at htt://jussiparikka.net. London, King’s College, Strand Campus. 4.30-5.30 in K3.11 on the Strand Campus of KCL. To find K3.11 you take stairs up from the Second Floor King’s Building at the Strand end of King’s Building. You can ask for directions at the Strand Reception.